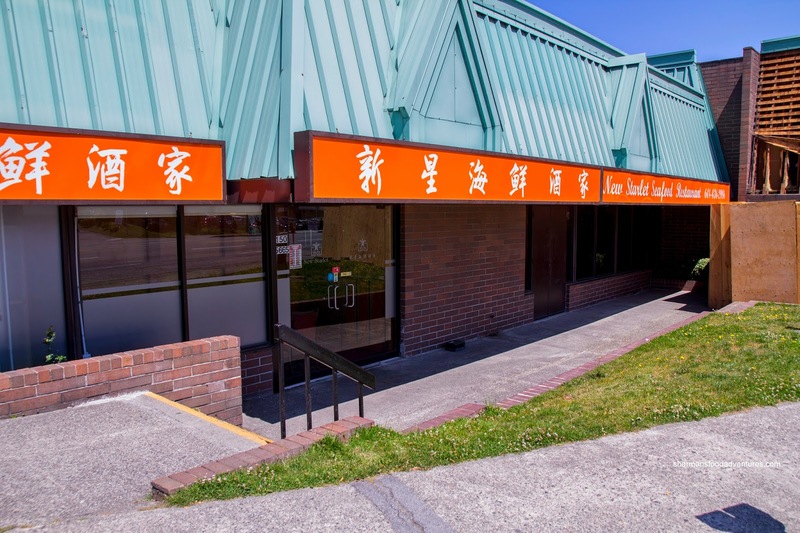 Costanza wanted to meet up for Chinese food in Burnaby, but really, there is not as much choice as one would think. I went through the usual suspects and concluded that we needed to try something new. Suddenly, it occurred to me that the evil Po King had left town (now in Richmond) and had been replaced by a more welcoming restaurant named New Starlet. I've been here for Dim Sum and the food was decent (if not pricey) while the service would make Po King just a fading nightmare. We started with the Daily Soup consisting of fish, fatty pork and watercress. The soup was boiled long enough to develop depth of flavour, but naturally, it was aided with seasoning. The flavours were clean and not an incredible amount of MSG was used. On a separate plate, there was a considerable amount of ingredients that we didn't even get to eat as there was enough food to come. 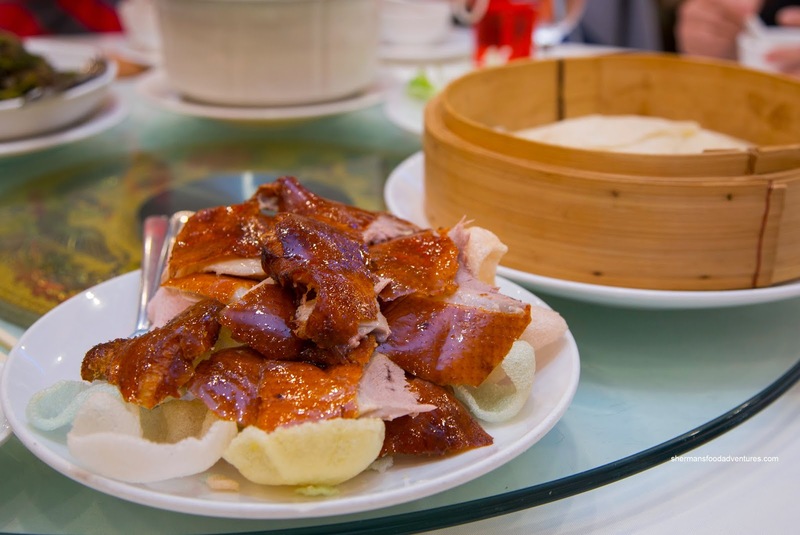 The first course of the Peking Duck arrived next and it was carved table side. They left quite a bit of the meat on each piece of crispy skin which made each wrap more substantial. 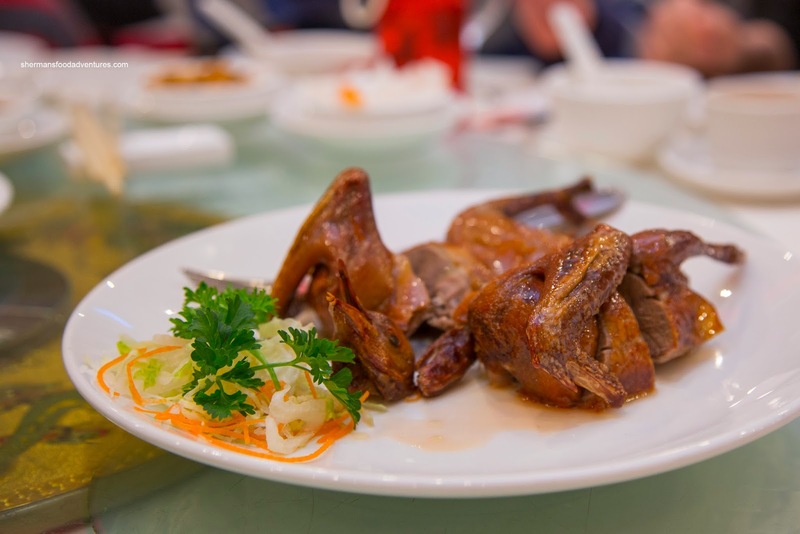 I thought the duck was decently prepared, but some pieces did have a noticeable amount of fat. As for the crepes, they were thin and slightly chewy, but not dry. Next, the second course, being the Duck Lettuce Wrap was wedged onto the Lazy Susan. They expedited our dishes really fast and we couldn't keep up. There was good wok heat as evidenced by its appearance (with the help of dark soy as well) and taste. There was good caramelization while the ingredients were not wet nor greasy. The meat was relatively moist while the veggies were crisp. They did a terrible job with the lettuce though as some pieces were unusable. 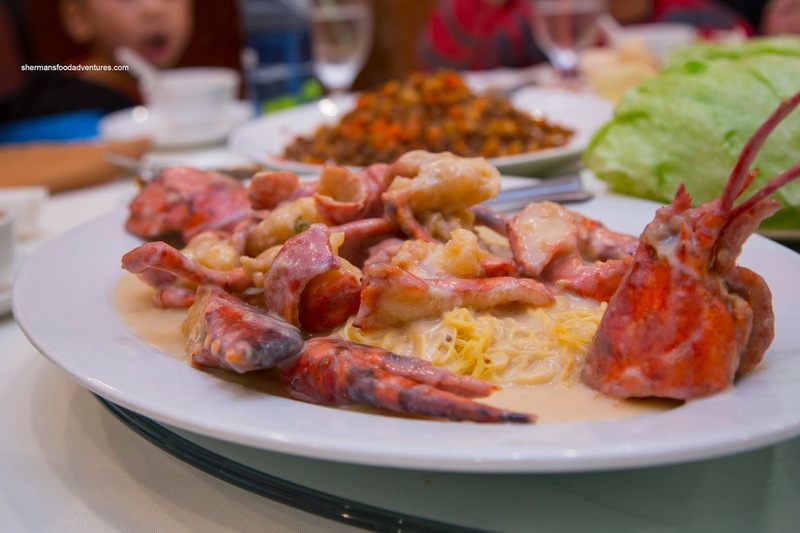 Since we got the special meal, it included a live Lobster, which we asked for it be prepared with a cream sauce and the addition of noodles. It was of a decent size where it was fried nicely as the meat was still succulent and had a good bounce. We noticed that the cream sauce was rather bland, but it was partly our fault as we asked for no onions (which would've added some sweetness and aromatics). As for the noodles, they were too soft. Next, we were presented with a Roasted Squab which was a bit pale in colour. Hence, the skin was not really all that crispy nor rendered. However, the meat was still moist and mostly tender. We would've liked to see more seasoning and/or brine as the meat was rather mild in flavour. The head didn't go to waste as we played a game of hot potato with it at the table. Nice to see the adults were being a positive influence on the kids... With what was probably our favourite dish of the meal, the Fisherman's Tofu Hot Pot looked simple, but the flavours were hardly so. 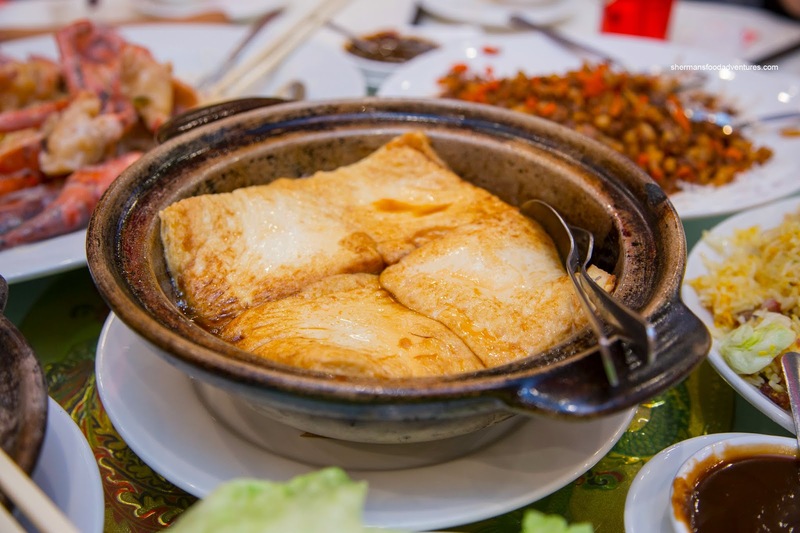 Hidden beneath the 4 big pan-fried pieces of silky tofu was a bevy of crab, scallops, shrimp, fish, dried shrimp and dried scallops. Hence, there was wealth of flavours that were both salty and a taste of the sea. 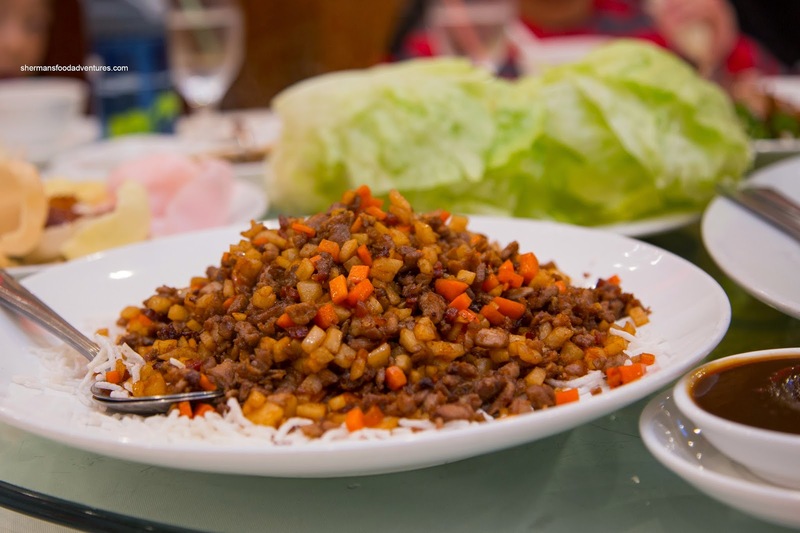 This went well with our next dish which was the Yeung Chow Fried Rice. 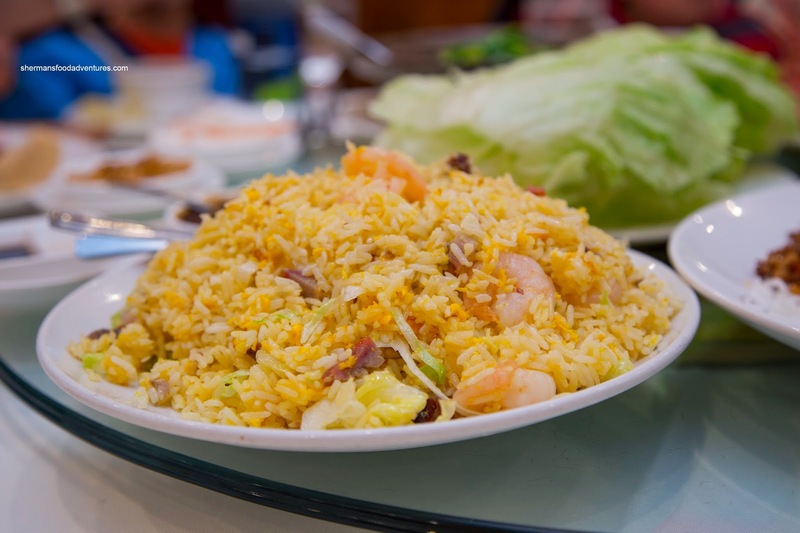 The Yeung Chow Fried Rice looked to be missing some wok heat and it was indeed that. Hence, the rice was a bit soft rather than chewy and nutty. Also, there was a general lack of seasoning which made the rice plain and not savoury. Therefore, we needed the intense sauce from the tofu hot pot. We did like the big crunchy shrimp though as it added nice texture. 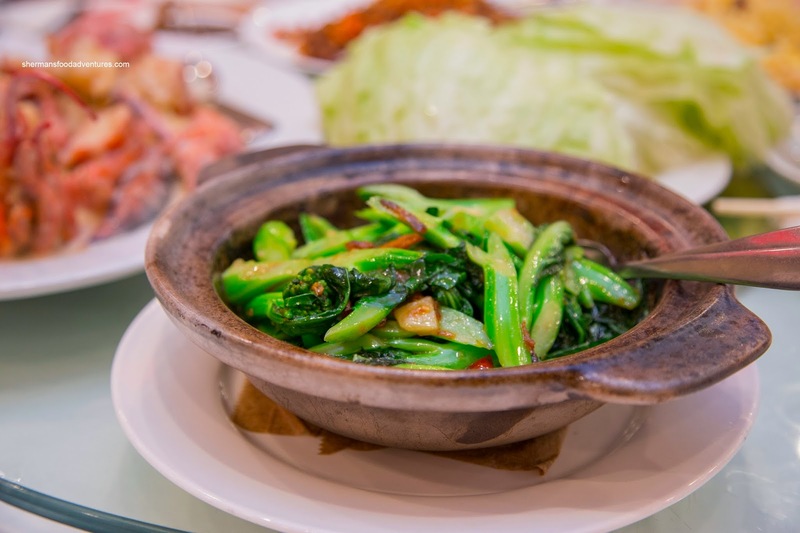 Our last dish was the Sauteed Gai Lan served in a hot pot. 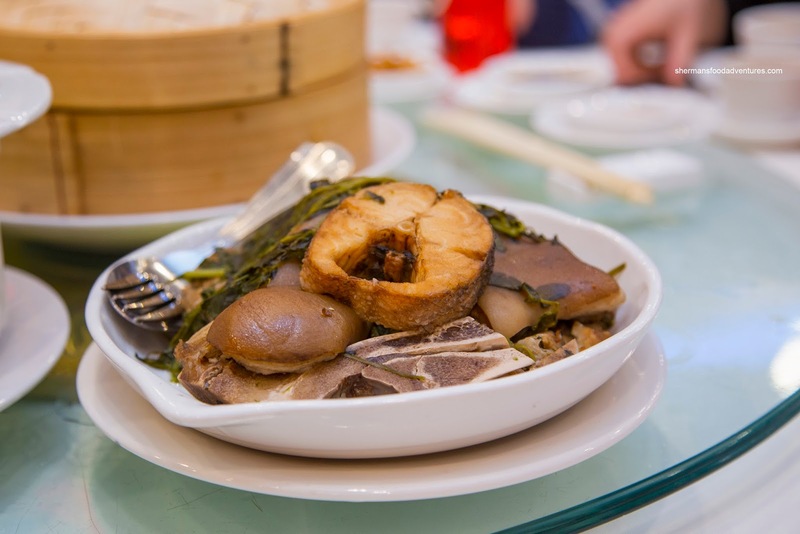 We were not a big fan of this dish as the gai lan were hacked up into little pieces which made each piece too soft. Furthermore, the whole thing was coated in grease which made it both hard to pick up and unappealing. However, the flavours were good as there seemed to be some fried bits that were pungent (salted fish?). Overall, the meal was acceptable with a few highlights. However, we found the pricing to be rather high.